With slender stems and large flowers, "Yuri", the Japanese name for lily, is said to have come from the verb "yuru", meaning to sway, as a lily does naturally in the breeze. 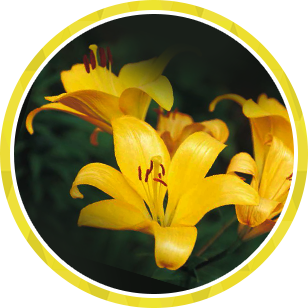 In Japan, lilies are in abundance and are known to have high ornamental value. Describing a woman's beauty, there is even this Japanese saying, "She sits and stands a peony and walks a lily". *The best time to see the flowers may vary depending on the weather conditions. This garden showcases 50 varieties and approximately 450,000 lilies on a large site. 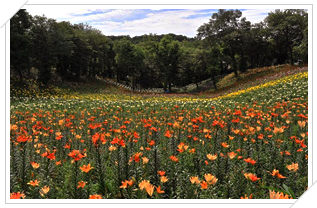 In fresh air in the midst of a forest, you can spend a relaxing time viewing an expanse of lilies. Early summer surrounded by nature in Tokorozawa's Ahha no Mori forest is a great time to enjoy the outdoors. Copyright© SEIBU Railway Co.,LTD. All Rights Reserved.